Black, brown or bluish spots, discolorations or splotches on the gums are usually nothing to worry about, but they can be unsightly and cause embarrassment or self-consciousness when smiling. The problem with gum spots is that they can make healthy gums falsely appear unhealthy. The gums are often just as visible as the teeth, therefore the appearance of healthy gums is just as important as healthy teeth are to a great smile. Luckily with dental laser treatment, these spots can be removed quickly and painlessly - with amazingly fast healing time. Some dark spots on the gums are caused by a build-up of pigmentation (also called melanin spots) in the gum tissue.These spots are nothing to worry about, for they are like freckles, except on your gum tissue instead of your skin. 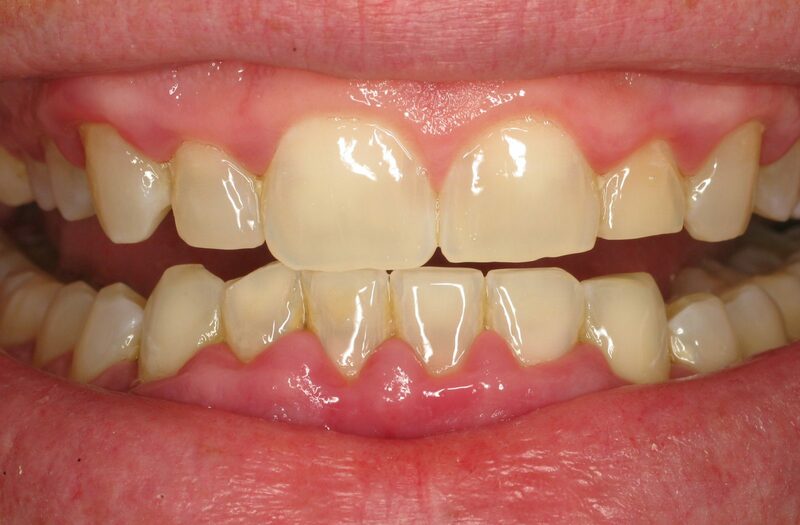 However, these dark spots may cause healthy gums to appear unhealthy, or simply interfere with the aesthetics of a smile, and some people would like to have the dark gum spots removed. These melanin spots on the gums can be quickly and painlessly removed (a process called gum depigmentation) with laser gum treatment – usually in one visit and with quick healing time. Sometimes, spots on gums are a result of simple genetics. 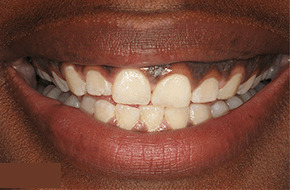 Darker skinned people have more pigmentation, and therefore have darker gums. This is normal. Occasionally, the pigment is much darker in certain spots. People who experience this may want to have the darker spots or blotches lightened or removed. Laser gum therapy can remove and/or lighten these spots, for a more even color of the gums. 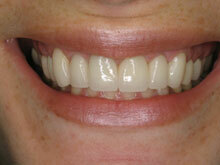 Gum bleaching allows you to change or improve the natural color of your gum. 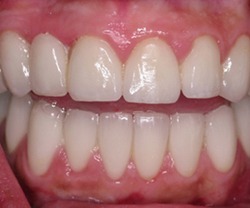 This technique uses a whitening gel that is applied to the soft gum tissue that lightens the discoloration. The mouth is numbed to prevent any discomfort during the procedure. Once the gel has lightened the gingival color, the gel is removed using a polishing cup to buff the gum tissue and remove the remaining melanin containing cells. 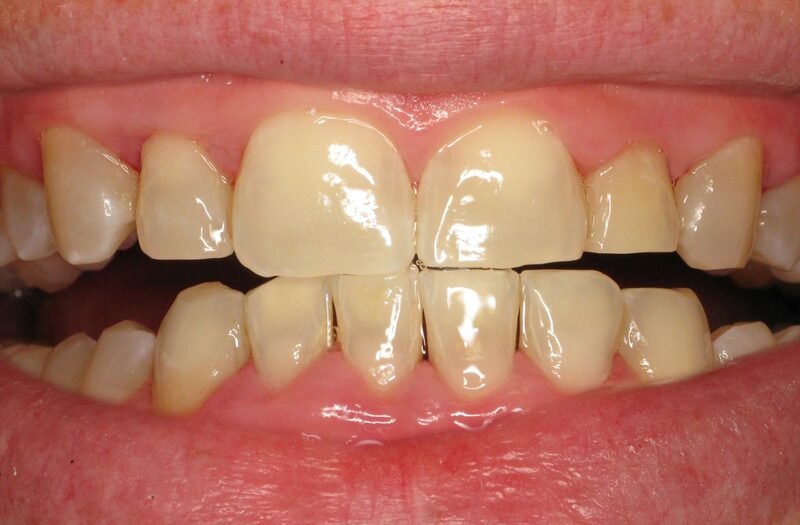 It's no surprise that smoking can cause dark or brown spots to appear on the gums. This condition is called "Smoker's Melanosis". These spots can sometimes, but not always, disappear on their own if the patient quits smoking. Quitting smoking is the best first step toward healthier gums and better overall oral health. However, Smoker's Melanosis spots can be quickly and easily removed from the gums through laser gum spot removal therapy. Some medications have been known to cause dark spots on gums. These medicines include tricyclic antidepressants, antimalarial drugs and minocycline (an antibiotic). Sometimes dark gum spots caused by medication fade or disappear when the medicine is discontinued. In some cases, such as with antidepressants, the patient is taking the medication indefinitely. These patients can be rest assured, knowing they can have a simple laser gum therapy treatment to remove the unsightly spots on their gums. Amalgam tattoos are caused by tiny particles of silver fillings, that migrate down to the gums. When a small amount of silver is beneath the surface of the gums, it can appear dark or bluish in color (much like the appearance of a tattoo). These are benign, as they are much like the discoloration that some jewelry can cause on the skin, but some people find them bothersome. 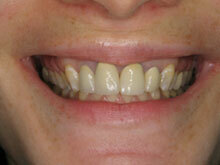 Amalgam tattoos can be removed painlessly with laser gum treatment. There are also several gum bleaching kits that can be done in the comfort of your own home. There are bleaching kits as well as bleaching toothpastes that help lighten the gum pigmentation. They aren’t as effective as laser gum treatment, however, they do still lighten the pigmentation after frequent use. With at-home bleaching you do have to be more cautious of how often you use them because they can be abrasive to the soft tissue when used frequently. 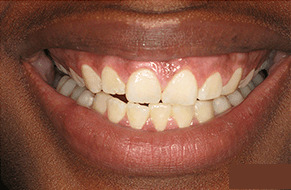 Sometimes, bleaching techniques are used on the gums to achieve a lightened appearance, or to remove spots. While bleaching does achieve lightening, the bleaching agents are abrasive, and often are used on larger areas than necessary. Dental lasers can pinpoint and treat only the exact area of the spot with a laser beam. What's more, unlike irritating bleaching agents, the dental laser beam is quick, painless and doesn't involve long healing time. What Is The Cost Of Gum Bleaching? The cost for this treatment in our office varies, but we ensure that our team will find the right package to make you leave our office with pink gums. To schedule a consultation or to learn more, call us at (877) 316-4330! What Is the Cost of Gum Depigmentation? The cost of this treatment also varies depending on several factors. In order to assure the best package for you, our treatment coordinators can inform you of your payment options and guide you through the process. To schedule a consultation or to learn more, call us at (877) 316-4330!